As autumn explodes, with it’s rich kaleidoscope of colors, it also brings crisp, chilly mornings. 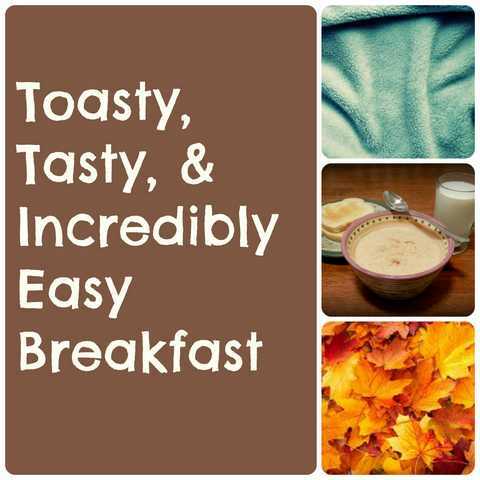 On these cool mornings, nothing feels better than a fuzzy blanket and something delicious and warm to eat. But who has time to sit around in the morning, in a blanket, eating delicious warm food? For that matter, who has time to make something warm in the morning anyways? During the rush of getting everyone ready for work or school and out the door, there is no time to wait for pancakes to cook and bacon to fry. But I’ve finally found a recipe that is delicious, warm, and quick! In under ten minutes, you can fill all your little tummies (and big tummies) with a toasty, filling breakfast, before you have to send them out the door. While searching for the measurements to make cream of wheat, I found this recipe at dominicancooking.com. I tweaked it to fit the ingredients that I had on hand. It’s a fun, new spin on the classic cream of wheat. It reminds me of how a cinnamon roll or a snickerdoodle tastes. Delicious! This recipe is designed to make six servings, and it really makes quite a bit. I make the recipe, as it is written, and refrigerate the leftovers for another easy, warm breakfast the next morning. But you can easily divide the recipe in half for less servings. 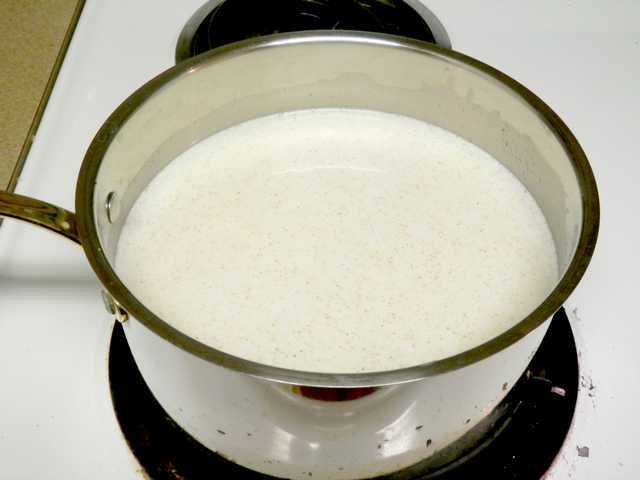 In a medium-sized sauce pan combine the water, milk, cream of wheat, salt, vanilla, cinnamon, sugar, and nutmeg. Heat over medium heat, stirring constantly. Stirring constantly is important. This keeps the cream of wheat from getting lumpy or sticking to the bottom of the pan. When it begins to bubble, add the butter. Turn the heat down to low, and stir until it reaches the desired consistency. The cream of wheat will thicken, as it cools. I always remove it from the heat, when it is thick but still has a liquid consistency. 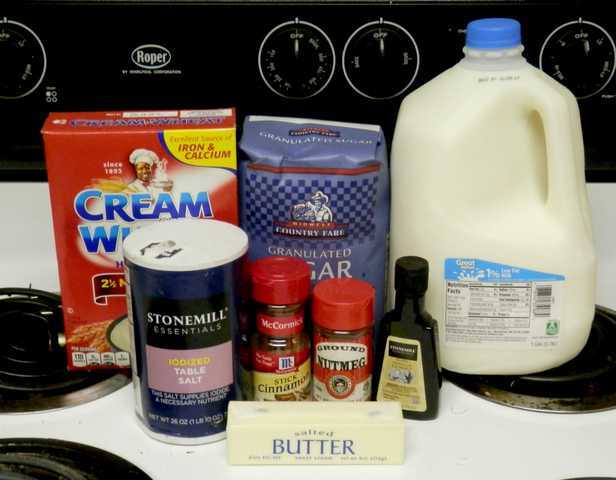 Let this mixture rest for five minutes. When it begins to bubble, add the butter. Turn the heat down to low, and stir until it reaches the desired consistency. The cream of wheat will thicken, as it cools, so I always remove it from the heat when it is thick but still has a liquid consistency. 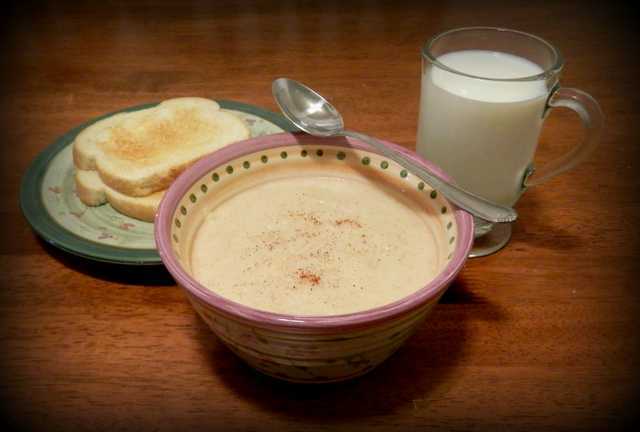 Cream of wheat can be flavored and it is a tasty healthy way to start the day. I haven’t had cream of wheat in years. This sounds really good and perfect for the chilly weather. This looks really good. I love vanilla, cinnamon, & Cream of Wheat. Putting them all together, great idea! This looks great, I normally eat just the cream of wheat as is, so this would be a nice change.